The following story is meant as an expression of gratitude to Seattle Pacific University’s splendid Music Department for the wonderful Sacred Sounds of Christmas concert they put on at Benaroya Hall last night. But along the way it will probably descend into maudlin, autobiographical sentimentality. I apologize for that ahead of time. If you don’t like sentimentality, you may as well stop reading right now. Caveat lector. But please don’t let the gushiness of the form obscure the seriousness of the point, which is to commend our colleagues in the performing arts for the brilliant work they do. Nineteen years ago, my wife Marilyn and I bought a new piano — an Everett upright. We shopped for it during the holiday season and were planning to buy it as a Christmas present for each other. At that time, Marilyn was pregnant with our first child, who was due in early January. The plan was to have the piano in the house before the baby arrived — and then greet our newborn with music. We imagined the day a few years in the future when our daughter would begin taking piano lessons herself. But, as Robert Burns observes, “the best laid plans o’ mice and men gang aft agley.” For one thing, Sarah arrived 10 days early — before the piano was delivered. So while Marilyn was still in the hospital with her, I arranged to have the instrument delivered and tuned. It was a minor glitch in a good plan, and the solution represented a major victory for hubby, whose household management skills are, well, modest at best. Moreover, we had a “Christmas baby,” instead of a “New Year’s baby,” which meant a nice year-end tax deduction. And on Christmas morning, Sarah was brought from the nursery to her mother swaddled in a red-and- green felt stocking. Nothing quite like the maternity ward of a Catholic hospital at Christmastime. Four months later, the bottom fell out of our lives. Sarah was diagnosed with a rare genetic disease that causes the skeletal muscles to turn into bones. Over time, the body is completely encased by heterotopic bone and thus immobilized. In effect, it turns into a kind of living statue. Marilyn and I both remember leaving the hospital after we learned of this ghastly disease. For some bizarre reason, I thought of that new piano, and burst into sobs, realizing that if her arms locked, she would never play it. The purchase suddenly seemed futile and pointless, and the thought that our home would not be graced by the sound of our daughter practicing scales and arpeggios symbolized the death of the elaborate fantasy-future that we had created for our firstborn. And my fears were warranted. Sarah’s arms locked when she was about 3, and she has never been able to reach the keyboard. But divine grace is what we find when our all-too-human plans and fantasies disintegrate. 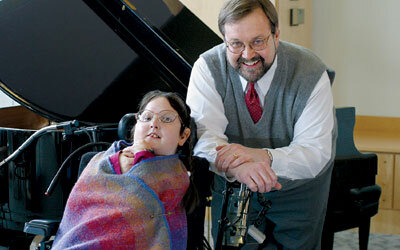 Over the years, Sarah has, in spite of her disabilities, proved to be a rather good musician. She cannot play any instrument, but she can sing. Her voice is soft and thin, because the ossification of her ribcage has severely reduced her lung capacity, and the ossification of her jaw muscles prevents her from opening her mouth more than a centimeter or so. But her pitch and tone are fine, and when she entered SPU as a freshman this fall, she signed up for Women’s Choir. She has loved every minute of it. Last night, as I watched Sarah on the stage of Benaroya Hall, singing Gounod and Mendelssohn with 200 fellow SPU students, I once again burst into tears. But these were not tears of sorrow and fear. These were tears of astonishment and gratitude for the many people — faculty, staff and students alike — who have made it possible over the past three months for her to participate in our University’s brilliant music program, a program that includes a richly variegated repertoire and is crowned each year by a Yuletide performance in one of the premier concert halls in the world. The privilege of participating in such a program is not lost on Sarah. She worked hard to get ready for last night’s concert. She spends her weekends at home, and during the last couple of weekends she has practiced her music assiduously. She was accompanied by Marilyn, playing our 19-year-old Everett upright piano. Like ourselves, the instrument is showing signs of age. But to me, it has never sounded better. A professor of moral and historical theology at Seattle Pacific University, Rick Steele chairs the Department of Theology, is chair-elect of the University Faculty and was selected as the 2004 Weter Lecturer. SPU freshman Sarah Steele likes to do handcrafts and plans to major in Spanish.